Thank goodness for old Claret magazines you can leaf through and see how things were way back in the yesteryear. Someone posted somewhere that anyone under 17 will have no idea of the struggles this club once went through; it’s been Championship or Premier League all the way for them. Not that the Championship was always a bed of roses. Far from it, administration beckoned on occasions, the ITV Digital fiasco nearly did for us, the buckets were out, and the word relegation cropped up more than once. So: it was fascinating as ever sitting through the final day of the transfer window and seeing on UTC the number of comments that we still needed this and still needed that, and we still needed a centre back and we still needed a winger. And then I was digging through some old London Clarets mags and spotted that 12 years ago our big signing was Duane Courtney for £25,000. Then, when we signed Ian Moore for £1million in the days of Stan, we were all amazed and went dizzy and had nosebleeds. Burnley spending a million, it was unheard of. But here we are today and we spend £15million on Chris Wood, and then in addition, there’s Cork, Walters, Taylor, Wells et al. So, anyway: at the end of last season it was getting harder and harder doing a weekly piece that was more than just a match report; so I thought I’d just send a piece every now and again when something turned up. So, with a bit of time to spare and when not falling asleep watching England in Malta, I dug out all the old London Claret mags I have, all 250 of them that go back to the days of Queen Victoria, and see what was in some of them. Number 145, January 2002, was a classic. It celebrated what looked like might be a good season with success at the end of it, either automatic promotion or at least a top six place. December of 2001 was a great time as Burnley beat Crystal Palace 2-1, Preston North End 3-2, Stockport County 3-2, and drew against Millwall. Near the end of November in a TV game on a Friday night they had consolidated their lead at the top of the division with a 1-0 win against Grimsby Town in front of 18,000+ fans. If memory serves, did we not go 5 points clear that night, but then as the dusk of age descends, my memory ain’t what it used to be. Then of course came those wins in December and we were all thinking what can stop us now. Of course as we all know, it did not continue and the top six was missed by a whisker. It was pointed out in Mag issue 145 that what was to come in the second half of the season would be the real test. There would be few if any cannon fodder teams to play and nearly every home game would be against a potential top-six side. As things stood there would be no more games against anybody below mid-table. The forecast that was made, that the second half of the season would be far more difficult, was sadly correct. Mother Shipton would have struggled to do better. ‘It’s easy to see why Watford supporters loathe Burnley. With their fantastic one-way system, big shops like B&Q and the redundant power station close to Vicarage Road, it’s hard for a down to earth place like Burnley to match the architectural majesty of the jewel of the M25. Watfordians used to spending their evenings lingering over cappuccinos in the fashionable High Street, as carefree citizens wander around soaking up the last rays of the autumnal sun, probably find the gritty and unpretentious surroundings of Burnley less than pleasing on the eye. What better things in life can there be than soaking up the pre-match atmosphere in the Parisian style sophistication of Downtown Watford which is only a stone’s throw away from Vicarage Road, especially when Luton are the visitors. Once you are in the stadium, it must be great to mingle with the crowds brought up on a diet of flair and sophistication, as epitomised by icons like Luther Blisset, Kenny Jackett, Ross Jenkins and the other big ugly bastards they had in their side at the time that made them the envy of Europe. Those sublime moments of skill will linger long after they have occurred, which must make watching the current Watford side somewhat painful. Next time I go to Vicarage Road, as I negotiate the outstanding curves of the Inner Ring Road and the circular nature of the one-way system, even as I seek to nizzle my battered old car amongst the Ferraris and BMWs of the local population, my mind will be turned towards those poor unfortunate Watford supporters. As I wander the twists and turns of the narrow streets I might be distracted enough to wonder why they built their houses so close together. I suppose it’s because they are such a friendly lot, unlike us. Yes, the place that gave the world the immense cultural talents of Elton John and Geri Halliwell must be a really great place to come from and must give everyone a sense of pride. ‘Je suis de Watford,’ you would be able to say on the beaches of St Tropez. ‘Io sono di Watford,’ you could say in the San Marco Plaza di Venezia. ‘Si, si, lo so, Luther Blisset, che un grande stronzo,’ they might reply in Milan. Being such a low and humble form of life form, I ought to be really grateful for the opportunity to visit such a magnificent centre of cultural and architectural and 21st century style that following Burnley presents us, in the shape of a trip to Watford. Flanked by the M1, the London Orbital Road, the A41, and those other mystical highways that lead to other similarly evocative places nearby such as Rickmansworth, Potters Bar and Barnet, it’s always the first fixture I look for. Monday night in Watford, I can hardly wait. I am off to choose my outfit, visit my stylist and colour co-ordinator. The manner of the defeat however was surprising after a reasonable start to the match. In particular the pressing game, the mainstay of our most impressive results against good teams completely deserted us. Anyway, a nice sunny day at Moss Side’s finest stadium. A mid-day kick-off but a generous helping of ale to ward off the vision of the City orcs a mere three feet of netting away. There was a fairly liberal interpretation of spring time around these parts or maybe they hadn’t actually closed from Friday evening. The stands here are of course hideous, designed by the same firm that did Stonehenge and will hopefully disappear soon. A couple of thousand clarets were in evidence to boost giving ‘the arrogant prats’ some serious oral abuse before the start of our cup final. Half-time and game over, so then, a huge disappointment again after a Man City game with a certain amount of gallows humour in the local hostelry, decreed that a slight variation of the normal method of choosing man of the match was required. This was primarily to cheer us all up and of course to pad out this short and hugely unsatisfying match report. So here it is; the Worst Man of the Match voting. First worst: Glen Little, more holes in his game today that a statement from the Transport Secretary. Second worst: Gareth Taylor did the work of two men today, Laurel and Hardy. Third worst: Alan Moore, a good player but with more Achilles heels today than the average biped. Fourth worst: Kevin Ball, raced hard for the ball but time’s iron grip had a firm hand on his shirt. Fifth worst Tony Grant: there are amoebas on Saturn which display better ball control than he did today. Sixth worst: Dean West, everything went over his head today so should look for future employment as a limbo dancer. Thus ended Stan’s dream to take the club he loved to the Premier League. The season before, the club had finished two points below the top six. Now it was just one goal difference. It was cruel. The fingers point to the defeat at Manchester City as being the catalyst for the run of games that saw Burnley fail in the dream again. Yet they were by no means down and out, still clinging to the hopes of the top-six place. The drama, however, was reserved for the very last game of the season against Coventry City at Turf Moor. A horrible 3-1 defeat at horrible Grimsby in the penultimate game was a sickener. Everything depended on the last game at home. Win it by two goals or more and the top six final position beckoned. By now Stan had signed Paul Gascoigne in a move designed to repeat the inspiration provided by the signing of Ian Wright a couple of seasons earlier. Sadly it was wasted money. With a 1-0 lead in that final game against Coventry it still needed one more goal and the game was into the final five minutes. Those of us there will never forget the feelings of desolation and emptiness when goalkeeper Hedman made two wonder-saves from Gascoigne’s free kicks. The latter had been brought on the final stages; it was if the stage was set for the goal that was so necessary, when the two opportunities arose. With minutes to go Norwich were leading 2-0 against Crewe and Burnley just had to score one more. David Johnson was brought down on the edge of the box. Gascoigne took the kick, a near perfect strike arrowing into the bottom corner but Hedman read it right, flung himself and saved. We groaned. But even then the game was still alive as another free kick was given with seconds remaining. This time it was Glen Little brought down. The free kick looked perfect again, but again Hedman saved. The whistle went, we were desolate beyond measure. Over the years probably most of us have managed to forget the heartbreak of that day. From then on it was pretty much all a downhill struggle for several years to come. I’d managed to expunge the memory of that heartrending final five minutes of that game. 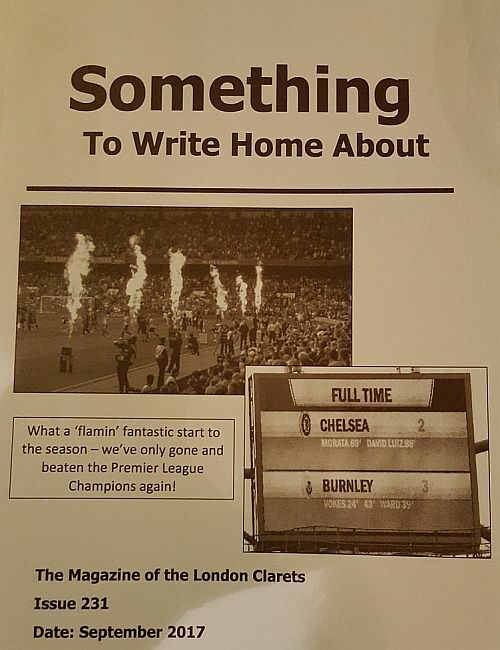 Issue 145 of the London Clarets magazine unfortunately brought it all back. Nostalgia is great sometimes, but at other times you could do without it.